Thai Army Chief General Prayuth Chan-ocha today confirmed that Thailand was now the subject of a military coup after bundling off bickering politicians and protesters to an army barracks where they have been detained. The General announced that armed forces and police had formed the National Peacekeeping Committee to protect the lives of the people and ensured that foreigners would be taken care of. The move was made after talks at the Army Club in Bangkok to which the general had invited representatives of the Pheu Thai caretaker government, Democratic Party opposition and protesters from the anti-government People’s Democratic Reform Committee, had broken down in squabbles. Present also were members of the Senate and Election Commission. 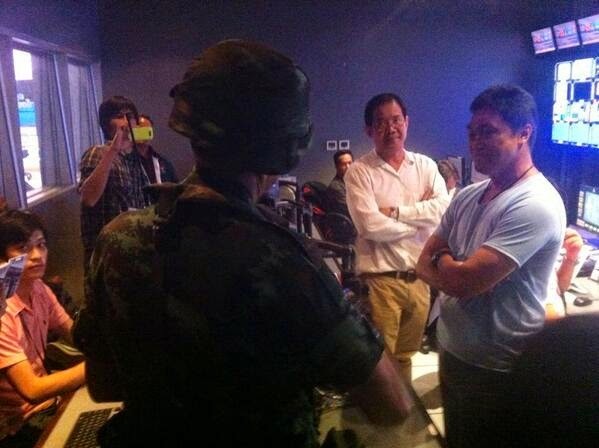 The army and police chief and top officials from the navy and airforce went on public television shortly after 5pm Thai time (10 am UK) forty minutes after the talks failed. Prayuth stood up ordered and end to proceedings and his guests were then taken away to the barracks of the First Infantry Regiment, located next to the Army Club. Trucks were waiting. Among those also detained was the former head of the government’s Center for the Administration of Peace and Order (CAPO) Chalerm Yoobamrung one of the government’s most bullish politicians. The army chief had issued orders for the Thai Prime Minister Prime Minister Niwatthamrong Boonsongphaisan and all Cabinet officials to report to the barracks in North Bangkok and later added former Prime Minister Yingluck Shinawara and 23 Pheu Thai MPs to the list. Only representatives of the Senate and the EC were not taken away in the military trucks. An hour earlier caretaker Prime Minister Niwattumrong Boonsongpaisan insisted he would not resign and said his caretaker cabinet would remain in office until a new elected government is formed. A BBC correspondent broadcasting from the Army Club expressed concern at a possible violent reaction from the pro-government red-shirts but they meekly packed their bags from their base in western Bangkokj and headed home. Meanwhile as is usual an immediate curfew was put into place from 10 pm to 5 am and transport services were stopped at 9 pm. 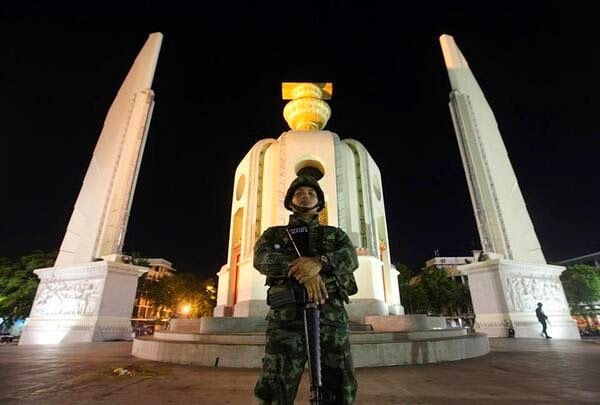 Thai television stations ceased their normal programming and instead showed patriotic military videos but people were still able to see the news by watching international news networks on the internet. Judging by the Army Commander’s attitude to politicians there are indications that he may form a temporary government by selecting a Prime Minister and Cabinet not from among their midst but from leading members of society and the civil and diplomatic service. 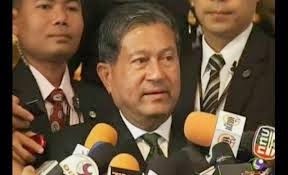 One of Thailand;’s most respected and certainly least corrupt governments was that of Anand Panyarachun who was twice selected to be Prime Minister after internal strife. Anand a former Thai Ambassador to the United States was untainted by corruption. Although appointed by a military Peacekeeping Council such as the one created today, as Prime Minister he ordered the removal of the top commanders of the armed forces. After a decade of misrule, the Thai people deserve greater respect for human rights, stronger institutions and more accountability. Rule by martial law is the opposite of the rule of law; it fosters an environment conducive to rights violations and should be revoked. On General Prayuth: “Having taken charge of Bangkok and surrounding environs in the autumn of 2006, his stock rose further with several more promotions. He also strengthened ties with the royal household. This quickly earned him the nickname of Sarit Noi, or Little Sarit, in tribute to Field Marshal Sarit Thanarat. Also born in Isaan, Sarit seized power through a putsch in 1957 and brutally cracked down on any left-leaning dissension until his death six years later, raising the monarchy to its paramount role still enjoyed in contemporary Thai society”. “Some may call it a coup d’etat. Some may say it’s about time. Some may realise that it’s the only realistic solution to the political impasse. “If there is ever a right moment for the military to step in, this is it. As an added bonus, it is also when Suthep has nowhere else to go. Again, it’s all about timing. Passing the ball, if you will. Well done General”. 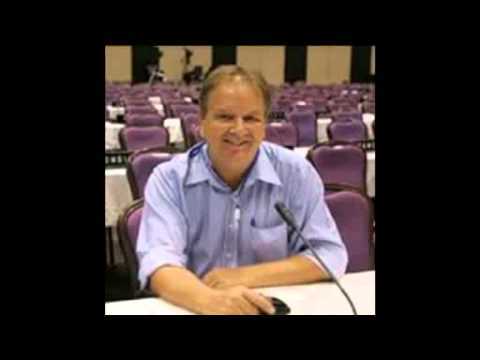 “Western media swooped on Thailand like scavengers sensing a dying animal down below. They were full of opinions, yet devoid of the full facts and unbiased information. “Article after article in major Western media outlets has failed to mention the massive abuse of power on the part of the government, its corruption of epic proportions, and the blood and tears of poor farmers who broke their backs working the soil only to see the cash owed to them for their crops go into offshore and local bank accounts of politicians and their cronies. They have failed to mention that it was the government’s misplaced intransigence and hubris that brought out millions of honest taxpaying citizens into the streets, unable to tolerate the daylight robbery of national coffers that they had paid in to”. “We are following developments in Thailand with extreme concern. The military must accept and respect the constitutional authority of the civilian power as a basic principle of democratic governance. International human rights standards, including media freedom, must be upheld. democratic process. In this respect, we stress the importance of holding credible and inclusive elections as soon as feasible.